Management Fees are easy to post with the Tenant File. You can post fees based on the full rent amount of each Tenant, or only on the amount collected between any two dates. If you want to post management fees after rent is collected, you can post individual management fees based on rent received within any date range, plus you can create a check to yourself if you wish. Property management typically includes a good bit of paperwork and accounting. While much of it is not particularly difficult, it is time consuming -- but our property management software can help to save a lot of time, freeing you up to run other aspects of your business, instead of being chained to the desk working on paperwork. Tenant File offers many time-saving features, and one of those is the automatic management fee posting. In fact, some users of our real estate management software find this to be one of their favorite features. At Tenant File, we know that not everyone runs their business the same way. Our rental management software provides users with choices about how to calculate management fees. One option allows you to post fees based on a date range. Simply enter the starting and ending dates and the property management software automatically enters the fees for all full or partial rent payments made during that time period. 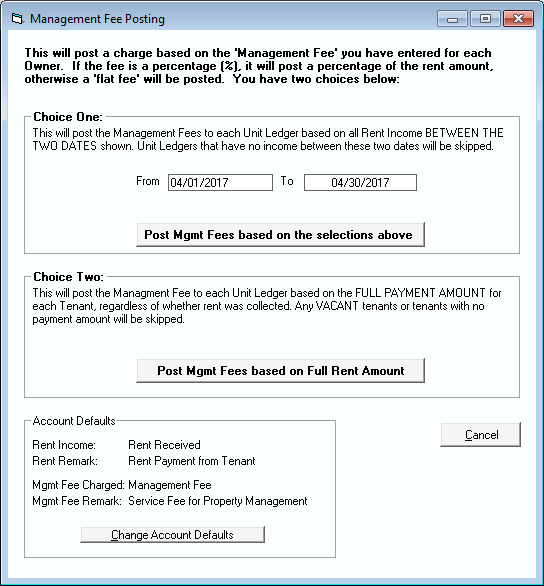 Another option is to set up the rental management software to charge management fees based on the information included in the tenant information. This is for the management companies that charge their fees whether or not the full rent was collected. You can either post both the rent income and management fees at the same time, or you can post the management fees later, after all the rent has been collected. Either way, our landlord software makes it easy. Tenant File understands just how valuable your time is, and how much time is often spent on routine tasks such as entering management fees. Let our property management software do some of the work for you. With just a few clicks of your mouse, you can enter hundreds of management fees, without ever breaking out your calculator. Call today to learn more about how our low-cost property management software can change the way you run your office.